A super spacious shed in which to store bikes for the whole family. The large, wide double doors make it easy to access and store your bikes on a day-to-day basis. 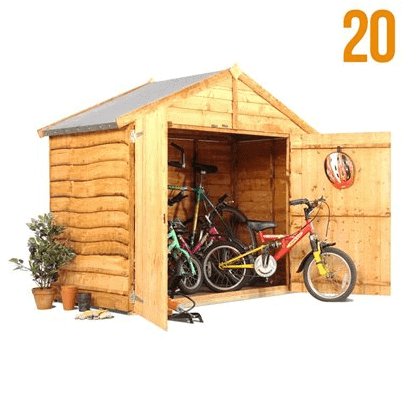 With its attractive looks and positioned at such a fantastic price for its size, this is one bike shed that you shouldn’t miss out on! 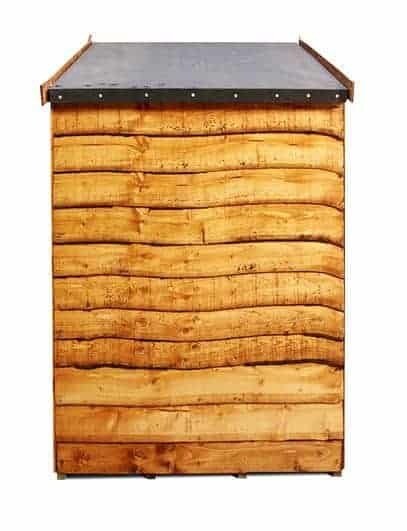 One of the wider and larger bike sheds, this bike shed is a handsome looking wood which is hard wearing and has tongue & groove cladding for extra strength. It will last you for years Stylish yet functional, it will store your bicycles away from the weather and keep them safe from thieves. With large double front doors you gain easy access to your vehicle whenever you need it. Wood is good for the environment as well as looking great in any outdoor space and this bike shed is suitable for light garden equipment too so it is a wise investment that is very affordable. You won’t be disappointed. With a traditional style, this model of shed would also be fantastic to use for garden and outdoor storage and accessories. With its wide doors and opening, it would be particularly useful for storing larger items such as trampolines and garden furniture. An excellent buy whatever you decide to use it for. 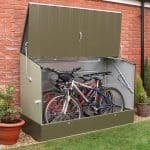 When looking for a bike shed, your needs will be different to someone looking for a simple garden shed in which to store outdoor equipment and the like. You will have certain questions like ‘how easy will it be to access my bike?’ and ‘will this shed protect my bikes from rusting?’ Below we identify and discuss any features that may appeal to you as a bike owner or as someone simply seeking an attractive looking shed for their garden. 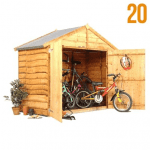 Exterior: The timber exterior of this bike shed is not only attractive but is working non-stop to protect your family’s bikes against the elements, keeping them dry and protected against mould and damp. Interior: The interior boasts a spacious floor area that will hold your family’s bikes, from dad’s prized mountain bike to the youngest member of the family’s tricycle. With the potential to store your helmets and accessories with hooks and shelves, you can keep everything neat, tidy and within reach at all times. Double doors: With large, wide double doors that span the whole front of the bike shed, they can be opened fully to enable you to be able to find what you are looking for in an instant. Use your bikes on a daily basis? No problem, with easy accessibility to the whole of the interior, you can take out and store your bikes easily, again and again. Security: In storing bikes within this shed, we are aware that security may be an issue. The shed doesn’t come with any security fittings, however if you require a padlock or similar security measure then these can be purchased independently at a modest price for your peace of mind. 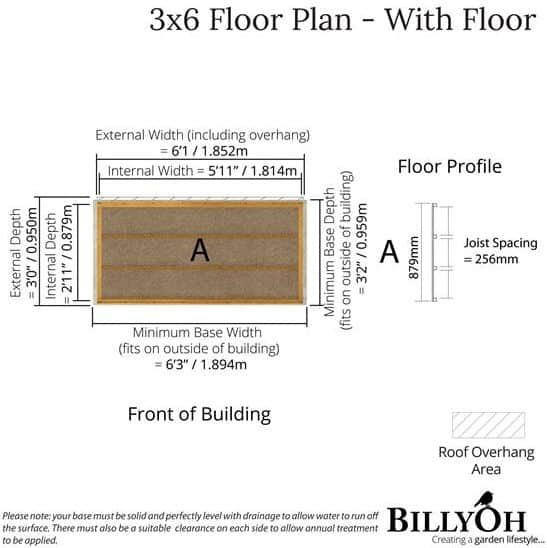 The BillyOh Premium Bike Shed: How easy to build? 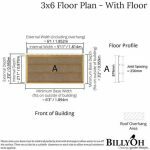 BillyOh make every effort to make assembly of your new shed as easy as possible. When your package arrives you will find all of the required panels, roofing material, screw, nails and fittings provided. All that is required on your end is to have, or have access to, a basic tool kit. 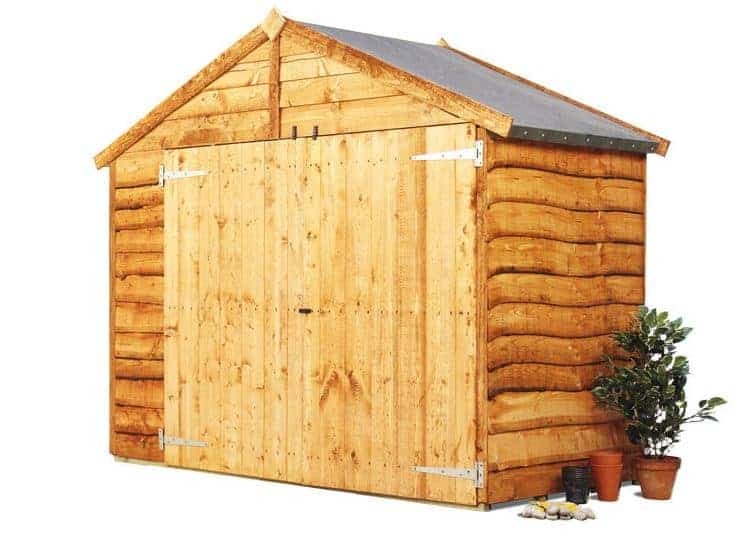 The timber panels are purposefully made to be easy-to-manage, making this shed great for one-man assembly. An instruction manual is provided in many languages and contains clear diagrams in which to follow. 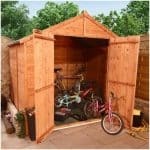 We expect this bike shed could be assembled within a couple of hours, however if you are time pressured then you may seek the help of someone else to make the assembly process as easy as possible. The BillyOh Premium Bike Shed: What is the overall quality like? BillyOh products are British designed and manufactured, providing exceptional quality outdoor and garden buildings, sheds and storage solutions at great prices for your pocket. The durable, timber exterior will protect your bikes from damp, mould and rust, as well as resisting the weather outside. 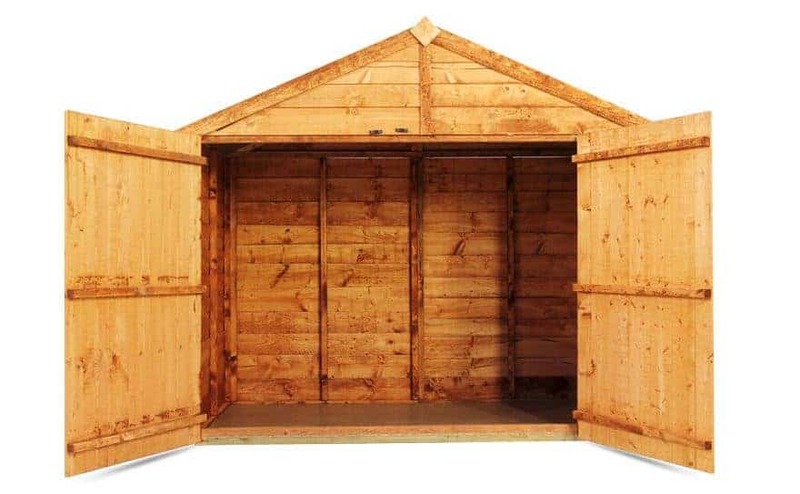 The timber is given a finish to ensure that your bike shed will withstand the wear and tear of bikes being pulled in and out of its doors on a daily basis, and maintain its smart appearance within your garden for many years to come. Should your bike shed need a clean, on the odd occasion it may get dirty from muddy bikes and the like, hose it down with a blast of water or sponge clean for a small area. An attractive timber shed with panels that are made to look as natural as possible so to blend into its surroundings within your garden. 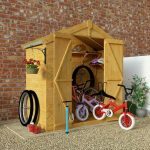 The design team at BillyOh know that not just any garden shed will do when it comes to storing your bicycles. 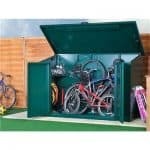 That is why this particular bike shed has been given easy access through wide doors, space to hang all of your helmets and accessories, and exterior and interior protection against the elements as well as mould and damp. A superb buy at a fantastic price that suits its purpose as a bike shed incredibly well. I am a big fan of bikes and I do own 4 of them myself. I have been looking around for an outdoor shed that would hold all 4 of them. I was glad when I came across this one. It is not only big enough, the quality of it is amazing. The shed is durable so I don’t have to worry about easy wear and tear with it. The price was exceptional and that was one thing about it that I just couldn’t pass up. The assembly was quite easy. I didn’t need anyone’s help. When it comes to am expensive bike, you want to be sure that you have it protected in the winter and during storms so nothing happens to them. I know I don’t have to worry about anything; mine are very secure in the shed. I really wanted to find a bike shed that was really equipped for mountain bikes and the equipment. Not just a garden shed that was big enough to store bikes. I had one of those and really it didn’t quite cut it. A bike shed has to have certain qualities,especially with the English weather so as to prevent rot and rust. This model seemed to take that in stride. It is weather proof and safe as far as security which makes it a little extra air tight as well. The price was what i was looking for and so was the longevity of the bike shed. It has spots to hang your pads and helmets and your equipment for maintenance. My equipment was not the slightest bit damp and for foam and plastic that’s good.